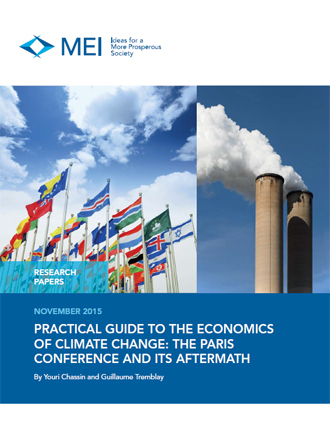 This Research Paper was prepared by Youri Chassin, Economist and Research Director at the MEI, and Guillaume Tremblay, Economist at the MEI. China is the biggest emitter of greenhouse gas, followed by the United States, the European Union and India. Since the first United Nations climate meeting, held in Geneva in 1979, emissions from fossil fuels have risen by 84%. Member countries of the Kyoto Protocol have cut emissions by 22.6% compared to 1990, but this has not prevented a 53% rise in global emissions from fossil fuels during the same period. Canadian greenhouse gas emissions rose 26% between 1990 and 2012, but their growth has stagnated since 2003. Canada generates only 1.59% of global greenhouse gas emissions but has higher per capita emissions than any other country except Australia. Various obstacles must be overcome to reach an agreement in Paris, such as the reluctance of some governments to accept binding targets or compensation for developing countries. Carbon trading and carbon taxes are two government tools that put a price on carbon. These tools enable decision-making to be decentralized, helping meet reduction targets at the lowest possible cost. A number of obstacles complicate the proper functioning of these tools, including the difficulty of measuring emissions accurately, the exclusion of some sectors or industries, the impact on business competitiveness, and carbon leakage. Fuel taxes are already very high in Canada, generating nearly $22 billion in tax revenue. The taxes set on fuels in Canadian provinces amount to a carbon tax, varying from $83 per tonne of greenhouse gases in Alberta to $128 per tonne in Quebec. Subsidies for renewable energy and for electric vehicles, or adding ethanol to gasoline, are ineffective in meeting targets for reducing greenhouse gas emissions. The constraints imposed by governments all have adverse economic impacts in the short term. Climate change has both negative and positive effects. Global warming of less than 2°C, as expected between now and the end of the century, will have positive net effects due in particular to higher crop yields. The three interrelated principles that can guide sound public policy in fighting climate change are effectiveness, tax neutrality and minimization of economic impacts. Energy intensity, or the amount of energy use per measured unit of production, fell at an annual pace of 1.25% between 1990 and 2013. China’s progress has been spectacular, with energy intensity dropping by half in 20 years. New technologies in the last 40 years have provided energy efficiency gains equivalent to 1.337 billion tonnes of oil in 11 countries. Saving energy through greater efficiency produces a rebound effect, with the energy saved being put to other uses. Thus, automobile efficiency gains have been offset by higher auto sales and larger vehicles. Compared to the United States, the energy efficiency of automobiles is 26% greater in Europe, where gasoline prices are 137% higher on average. Energy consumption in industrialized countries has been relatively stable over the past 15 years. According to the International Energy Agency, these countries will not be consuming any more oil in 2020 than they do today. Carbon intensity, or the ratio of carbon dioxide emissions per unit of energy used, reaches higher levels in emerging countries than in industrialized countries. In the United States, the shale gas revolution resulting from hydraulic fracturing and horizontal drilling has helped lower the use of more-polluting coal. Renewable energy capacity skyrocketed between 2004 and 2014. Global installed capacity rose by 671% for solar energy and by 1,147% for wind energy. At the end of 2014, 13 large-scale carbon capture and storage facilities were in operation around the world, with a capacity of 26 megatonnes of CO2 per year. Climate change hits poor countries harder, both in terms of mortality rates and of economic losses as a proportion of GDP. Between 1970 and 2008, for example, more than 95% of the deaths caused by natural disasters occurred in developing countries. The global rate of mortality due to extreme weather events has fallen by 98% since the 1920s, showing that human vulnerability to climate is due mostly to economic conditions. Malnutrition, diarrhea and malaria, made more frequent by climate change, are risks associated mainly with poverty. The fight against climate change should not lead us to forget other health problems, such as the fact that three billion people are exposed to smoke from solid fuels used for heating and cooking, according to the WHO. Access to cheap electricity is therefore a significant means of improving current health conditions, even if this electricity comes from fossil energy. Between now and 2085, only 13% of deaths due to famine, malaria and extreme weather events will result from climate change. Environmental awareness is linked to wealth, as shown by a United Nations survey showing that, among 16 priorities, climate change ranks dead last, especially in poor countries. From November 30 to December 11, Paris will be playing host to the 21st United Nations Climate Conference at which a future agreement is to be negotiated, intended to apply to every country as a way of limiting global warming. Following conferences that were widely regarded as failures, and in the absence of a binding successor agreement to the Kyoto Protocol, the Paris meeting is seen as a turning point. Will there, or will there not, be an agreement? What about North-South negotiations? Will the BRIC countries sign on to the agreement? Will binding targets be set? All international negotiations pose challenges. This case is no exception, especially with the fight against climate change blending political rhetoric, economic logic and climate science. We are economists, not climatologists, and as such we will not enter into the current scientific debate on climate change. Our premise is that of the great majority of scientists, who hold the view that global warming since the pre-industrial era is caused mostly by human activity. We will content ourselves with presenting an overview of the basic ideas used by climatologists in areas more closely related to the economics of climate change. avoid emotional or moralizing approaches so as to understand public policy choices and to base them on the most pertinent facts. We have aimed to stay away from declarations and good intentions, focusing instead on results. Around the world, various politicians have spoken loudly, but their words are not always matched by deeds. Opinion leaders talk passionately about our moral responsibility, but neglect certain issues of vital importance. Activists exalt the benefits of certain solutions, but are silent about the costs. An economic approach to climate change pays more heed to tangible results and to the various facets of the issue, taking account of benefits as well as costs. Four chapters provide an understanding of the climate change issue based on a wide variety of documentary sources, with 43 charts and tables. A bibliography will enable readers to continue seeking answers on their own. Given our ambition of making the issue understandable to the broadest possible public, it seemed essential to us to start with the facts. An unvarnished diagnosis is necessary, especially as regards the global level of greenhouse gas emissions, which keeps rising despite all the international gatherings since 1979. This is the aim of the first chapter, organized in the form of 20 questions and answers concerning the international negotiations leading up to the Paris Conference. Even if the conference were to end in failure, with the world’s countries failing to settle on or comply with a binding universal agreement that could serve to limit the likelihood of more than 2°C of warming, this would not prevent various governments from adopting policies to fight climate change. The second chapter shows that, although it is not easy to convert some of the less certain results of climate science into public policy, there are many tools available to governments, and some of them are already being put to use. This applies in particular to Quebec’s carbon market and British Columbia’s carbon tax. Fuel taxes, as we shall see, are already widely used. In addition to governments, communities and businesses are also involved in worthwhile developments, many of them highly promising. The third chapter outlines the global trends that offer reason to believe an energy transition is already in progress, even if its effects are still marginal. Global emissions continue to rise, but the intensity of emissions is falling, and some promising technologies could become more widespread. Finally, the issue of adaptation is addressed in the fourth chapter, since adaptation has always been the way humans respond to variations in climate. Even with warming limited to 2°C, there will be transformations that have both negative and positive effects on various population groups. Factors such as economic development and the availability of technologies will be decisive if adaptation is to be successful.